This one page handout briefly describes the alignment of Reading Mastery Signature Edition with the Common Core State Standards. This document shows how Reading Mastery Signature Edition Grade K aligns with the Common Core State Standards. This document shows how Reading Mastery Signature Edition Grade 1 aligns with the Common Core State Standards. This document shows how Reading Mastery Signature Edition Grade 2 aligns with the Common Core State Standards. This document shows how Reading Mastery Signature Edition Grade 3 aligns with the Common Core State Standards. 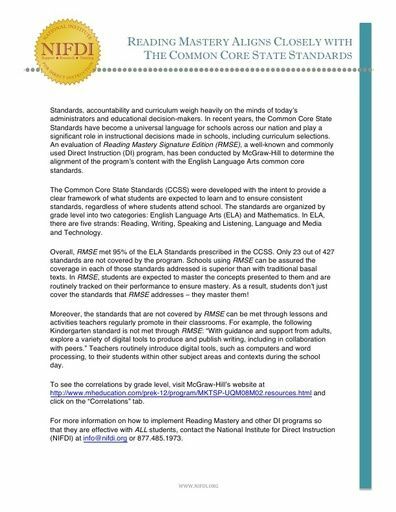 This document shows how Reading Mastery Signature Edition Grade 4 aligns with the Common Core State Standards. This document shows how Reading Mastery Signature Edition Grade 5 aligns with the Common Core State Standards.